It did not help that I came here on one of the gloomiest, coldest days of February 2009, but this must always seem a remote spot. And yet, it is rather a charming one. All Saints was declared redundant long ago, back in the 1970s, and that should be no surprise. This is a huge parish, and the main village it serves is more than a mile off. The opening of a modern chapel of ease there must have sounded the death knell for All Saints. Now, the liturgical life of this building is over, and the silence fills its days out here in what feels like the middle of nowhere. In fact, we are barely three miles from the outer edge of Norwich suburbia, but you wouldn't know it. 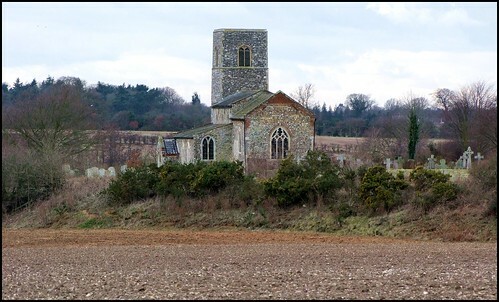 This lonely little church sits on its bluff above the fields, with only its gravestones for company, reached by a narrow track along the edge of a field, which peters out as it reaches the church gate. This must be an ancient site. Ridges in the adjacent fields show that there was a settlement here, probably until well into the 19th Century, but now everybody lives down on the other side of the Norwich to Wroxham road. Rackheath Hall was home to first the Pettus family and then the Straceys, and above all else this church is their mausoleum. The first sign of this is in the graveyard, where the Straceys' sombre matching crosses stand, fenced off still, to the east of the church. The Pettus memorials are elegant and lovely, and surprisingly grand in such an outpost, although they also serve as a reminder that, until barely three hundred years ago, if we had been here we would have found ourselves just outside the second city of the Kingdom. The most striking is to Thomas Pettus, who in 1723 was taken from the tender embraces of his most indulgent parents that he might receive the rewards promised in another life to a most engaging friendly behaviour, a most strict and filial obedience, a most sincere, regular and early piety in this. From a quarter of a century earlier, but looking the work of another quarter of a century before that, the bold memorial to Thomas Pettus's grandfather is a rather more serious and sombre proposition. The Stracey memorials are more workaday, and form a kind of catalogue, one of the most complete records in stone of a Norfolk family's fortunes over the ups and downs of several centuries. Probably the most beautiful is a 1930s monument to Mary Elizabeth Brinkley, in that flowery development of Jazz Modern which was popular at the time, possibly as a kitschy reaction to the severe lines of cinemas and public buildings of the age. Noting that she was a great-great-grand-daughter of Richard Brinsley Sheridan, it concludes with an equally flowery epitaph, which observes in part that from out of the murk and mistiness of life her dreams arise, most cool and delicate, and circle her like white and azure flowers. This is credited to Eleanour Norton, an obscure poet best known for the mawkish Enshrine Thy Youth, which was popular in the years leading up to the First World War. Finally, several 20th Century brasses recall the familiar heartbreak of this intensely rural parish. Horace Arthur Symonds of Hall Farm, Rackheath, died of his wounds on March 3rd 1916, and is buried at Etaples near Le Touquet in northern France. The Saints of God! Their conflict past, and Life's Long Battle won at last, no more they need the shield or sword, and cast them down before the Lord. The epitaph is curiously militiaristic, suggesting that the memorial was erected while the conflict is still in progress, and before the reflectiveness which followed the Armistice. Beneath it you'll find eleven year old Muriel FJ Bidwell, Chorister of this church who was mortally injured by a motor car, and entered Paradise 10th December 1925. I knew to look for this because earlier in the day, at another church, I had met an old man who had grown up in Rackheath. As an infant, he had attended Muriel Bidwell's funeral. She had been playing in a puddle at a corner in the road, and the car had skidded and crushed her. The lesson of this had obviously been made very plain to the children of Rackheath at the time, and now in his late eighties he had never forgotten it.